Bilirubin levels naturally peak on day 3 or 4 of life. It is not a coincident that this peak occurs at the same time most newborns are at their lowest weight. Once a child is feeding and stooling well these level typically decrease. 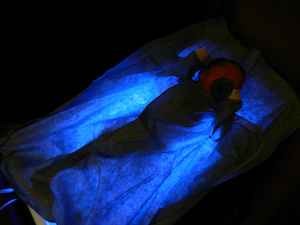 If your child is “too jaundiced” your doctor may initiate phototherapy. 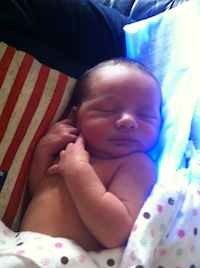 Phototherapy typically consists of lights above your baby. The infant pictured on the right is laying on a bili-blanket. These lights help reduce the bilirubin level. This newborn is laying on another type of bili-blanket.